Here is a healthy, hearty weeknight meal when you don't really feel like cooking. 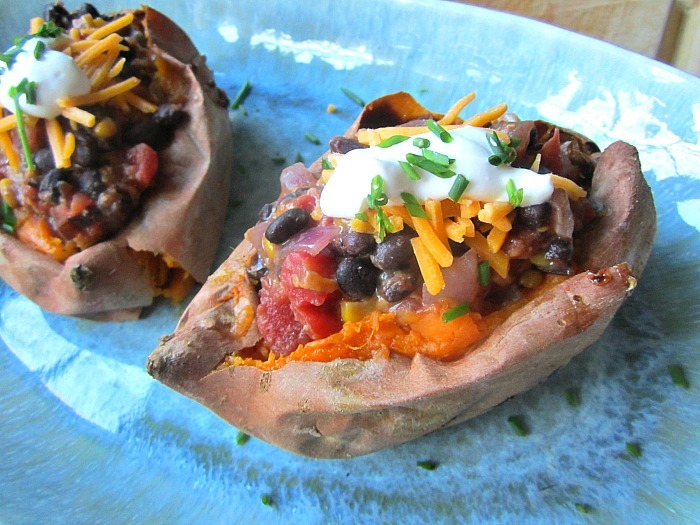 Sweet potatoes are a super food, loaded with vitamins A & C and high in fiber. I always bake an extra one, so the next day I can spread it on my avocado toast. Yes, you can microwave your potato, but the skin won't get nice and crispy, and the sugars won't ooze out of the fork holes. So let's just bake them in the oven for 1 hour at 425F. Once your potatoes are baked, the possibilities are endless. 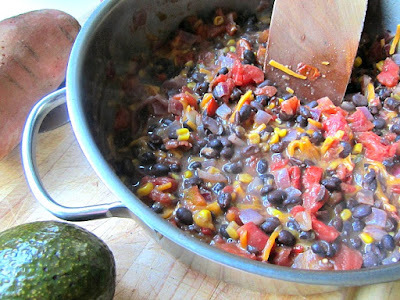 Here, I made a vegetarian chili with black beans and everything in a can. Just open your kitchen cupboard, I am sure you have plenty of stuff to use as toppings. In a saucepan, cook the onion in some olive or avocado oil with the peppers for a few minutes on medium heat, just until softened. Add in the beans, tomatoes, corn, and cumin and simmer for just a few minutes. Now here's the good part......dump in about 1/2 cup of the cheese right into the hot chili. The cheese will melt and the chili will become thick and gooey. Cut each potato in half and press down to create a pocket. 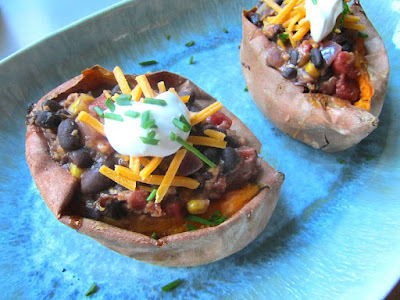 Fill with the chili and top with some more cheese, sour cream and chives.